I'm currently experiencing some odd issues on Xbox One with this, and was wondering if anyone else used this ocean system with Xbox One and can find the fix for it. I'm using Ocean SSR Foam and modified it a bit to fit more with the stylizing of my title. Though everything from the material is the same, so nothing material code wised changed. Is this running on Deferred or Forward renderer? Also, which UE version you running? Running deferred rendering and UE 4.19. Runs fine in editor and Windows build, just not X1. Hi, I'm having problems with the truesky + oceanproject. When I have the camera below the clouds I see everything correctly. But when I have it over the clouds I see the ocean instead of the truesky clouds. Is there a solution to see it correctly regardless of where the camera is, or at least how to see the clouds when the camera is above them? Your issue here is that TrueSky doesn't know how to behave when there is a translucent material, this is called sorting issue, and happens with these materials. I am making a small video to show you an idea on how to fix, but I really don't know if it will. Note that the second method works but every other translucency material applied must have the sort priority variable set aswell, so the 1st method is prefered if TryeSky allows it. Please, let us know if this worked or not intrus03 ! The video will be live in 20min approx. Last edited by NilsonLima; 03-27-2018, 06:41 AM. I'm going to try multiple of the ocean shaders to see which are broken currently on Xbox, but this is currently the comparison. Seems like maybe there is too many instructions for UE4? Get this error while compiling. 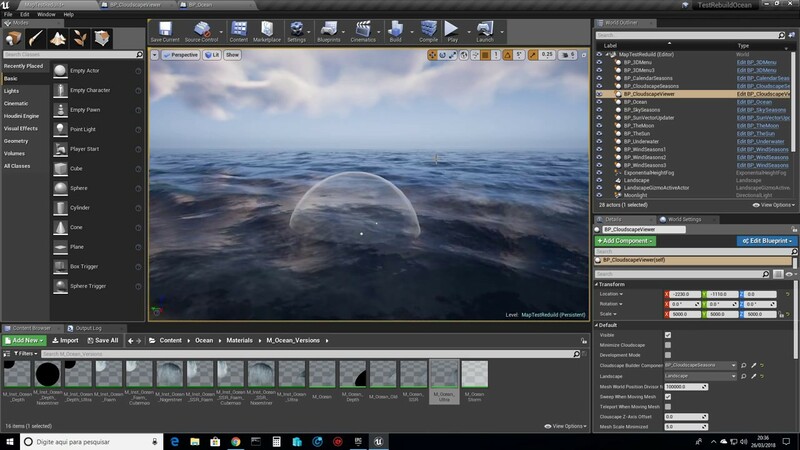 LogShaderCompilers: Warning: D:\UE4\_UE4_\UnrealEngine-4.19.0\FreedomPuzzle\Content\Ocean\Materials\M_Ocean_Versions\M_Ocean.uasset: Failed to compile Material for platform SF_XBOXONE_D3D12, Default Material will be used in game. Last edited by AmbiguousInt; 03-26-2018, 10:53 PM. You don't get any more detailed debug info? That's pretty ghetto. Nope, just pops that message out when compiling for Xbox, doesn't show anything else. Makes debugging pretty hard. I used a simpler shader and it works just fine now. Last edited by AmbiguousInt; 03-27-2018, 02:42 AM. Which is the scalability settings at that running screen? High? I don't think it is an instruction amount restriction, but some feature in use not enabled. Is it possible to build a small sample in 4.18.3 and check if the same issue happens? It would be a good idea do it to see if this is not some new issue brought by 4.19. Yeah it is running on high scalability. Changing it to any other still wouldn't work. And sadly never had a 4.18.3 source, as it requires certain Xbox SDK updates so I avoided constantly updating the engine. Latest SDK I had was around 4.16. There was quite some changes from 4.16 to 4.19. I guess the only think I can do to help is trying to cause the issue here somehow. Give me some more time to look into this. To clarify, I never used the ocean shader until yesterday morning so I'm not entirely sure 4.16 version of the ocean shader has the same issue. I looked into this thread into other possible Xbox users and only found one person, and he had crashes with scene color. It doesn't crash anymore so I guess that's a plus. - not 100% if it is the ocean of another component in my test, but something is requiring Shader Model 5 when I attempted running the build I have packaged to Shader Model 4, usually I only use SM5. - as Im not testing in a XBox One kit, it is interesting to know if you are using one and how updated it is, because older models support only SM4 and not SM5. If you dont have the kit and are developing inside a pure console it is interesting to know the model to track this. I will still try to break stuff here. I am indeed testing it on an Xbox One Kit, specifically Xbox One S. It has the most recent update as well. And in this case which is the shader model set when packaging for Xbox? In my tests it is not working with SM4 only SM5, but I still need to rip some things off before calling out that this need is from the ocen itself. Xbox One only uses SM5 as its DX12. PS4 uses SM5 as well.